Town to town, school to school, church to church, mosque to mosque, shop to shop, café to café… or any combination of the above. Beating The Bounds: Be proud of your Fairtrade Town status. Walk around your town’s boundary, putting up Fairtrade Town signs as markers! Beating The Bounds is an ancient tradition, still enacted in some areas. See Beating the bounds for more details, and ideas to adapt; It is thought that it may have originally been derived from the Roman Terminalia, a festival celebrated on February 22nd in honour of Terminus, the god of landmarks, to whom cakes and wine were offered, so why not recreate that with Fairtrade cakes and wine at the end of a nice walk? Beating The Bounds offers a chance to link up with local history groups. The Ammanford group are planning a walk where a local historian will talk about the bridges which mark the town’s borders. The Llandrindod group have organised a walk around their town which highlights both fairtrade outlets and sites of historical interest. 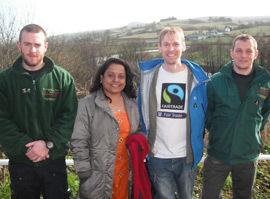 Fair Trade Cardiff are developing Fair Trade Ways in partnership with the City’s Walking For Health co-ordinator. The Carmarthenshire group are working with their Council’s Rights of Way and Tourism and Marketing officers. Have a Fairtrade Group meeting on the move! Instead of meeting in your normal Hall, organise a walk, and talk as you walk… The ideas and inspiration will flow! Use fresh air to revive a flagging group! Arriva Trains Wales and First Great Western have Fairtrade hot drinks on their buffets and trolleys. Take a train ride to a Fairtrade Town, or meet up with other Town groups on the same line for walks. Dress in a banana costume! Give your carnival procession a Fairtrade theme! A Schools Samba band are leading a walk in Wrexham! Fed up with your local supermarket not stocking Fairtrade? Organise a Fair Trade Way March!